Although a variety of broad-spectrum antibiotics have been developed, broad-spectrum antiviral agents have proved more difficult to identify. Effective treatments have been developed for individual viruses such as HIV, herpes viruses and influenza viruses – and vaccines have also been developed against papilloma viruses and herpes viruses – but there is a need for small molecules that are able to treat a range of viral infections and could also be used against newly emerging viruses. Researchers led by a team at UCLA have now identified a compound, LJ-001, that can treat a range of enveloped viruses. The team screened a library of around 30,000 compounds against Nipah virus, a pathogen that was first identified in 1998 and causes severe disease in both animals and humans. Further tests showed that LJ-001 was also effective against other enveloped viruses including Ebola virus, HIV, hepatitis C virus, West Nile virus, Rift Valley fever virus, yellow fever virus and influenza A virus, but had no effect against non-enveloped viruses. The compound interacts with the viral lipid envelope and inhibits viral entry at a step after virus binding but before virus–cell fusion. Although LJ-001 also binds to cellular membranes, the team believe that its low toxicity can be attributed to the fact that metabolically active cells are able to repair their membranes whilst static viruses are not. LJ-001showed no overt toxicity at effective anti-viral concentrations in either in vitro or in vivo studies, and pretreatment of mice with LJ-001 prevented virus-induced mortality from Ebola and Rift Valley fever viruses. Although highly active antiretroviral therapy (HAART) has proved effective at controlling HIV-1 replication, eradication of the virus from an infected individual cannot be achieved with current treatments. Latently infected, resting memory CD4+ T-cells and macrophages act as reservoirs for the virus and so called “shock and kill” strategies (activation of HIV-1 in the presence of HAART to block viral spread followed by stimuli leading to cell death) have been proposed to eradicate the virus. Histone deacetylase inhibitors (HDACIs) have been shown to be effective for the “shock” phase, but their use is limited by toxicity at the levels needed for viral reactivation. A team of Italian researchers looked for ways to improve the effectiveness of HDACIs and found that adding buthionine sulfoximine (BSO) to class I HDACIs reduced the concentration of HDACI needed to reactivate HIV-1 in cell culture experiments. The team hypothesised that, since HIV-1 transcription is enhanced by oxidative stress, glutathione depletion might create an intracellular environment that facilitates HIV-1 activation by HDACIs. BSO inhibits γ-glutamylcysteine synthetase, the rate limiting enzyme in glutathione synthesis, and has been studied as an adjunct to chemotherapy. At non-toxic concentrations, class I HDACIs only reactivated virus in some of the cells but, when BSO was added, all of the cells responded and were killed. MS-275, a class I HDACI currently undergoing clinical trials for the treatment of cancer, was one of the compounds found to reactivate HIV-1 more effectively in the presence of BSO. 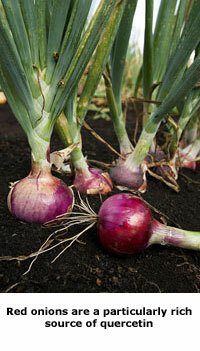 The combination showed low toxicity in uninfected cells. Although much more work needs to be done, the authors hope that their research may open up new avenues in the search for ways to completely eliminate HIV-1-infected cells from the body. The study is published in the journal Retrovirology. 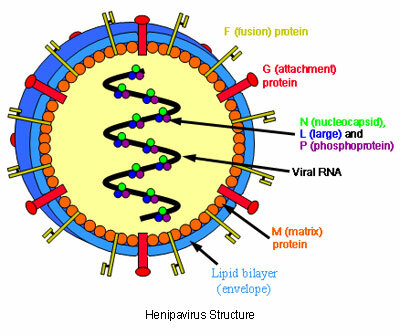 Two viruses from the Henipavirus genus, Nipah (NiV) and Hendra (HeV), are recently emerged zoonitic (transmissible from animals to humans) paramyxoviruses that cause encephalitis in humans. HeV, previously known as equine morbillivirus, emerged as the causative agent of an outbreak of fatal respiratory disease in horses and man in Australia in 1994. 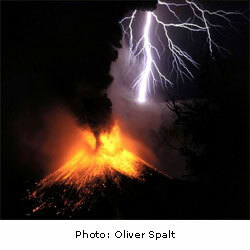 NiV emerged in 1998/1999 in Malaysia and Singapore causing fatal encephalitis in humans. Human fatality rates can be as high as 75%. Researchers at Weill Medical College of Cornell University, Australian Animal Health Laboratory, University of Tennessee Health Science Center and Rockefeller University have now developed a high-throughput assay that is able to identify inhibitors that target several stages of the viral life cycle. Their initial screen showed that chloroquine, approved for malaria treatment, inhibited infection with live HeV and NiV at a concentration of 1µM in vitro (IC50=2µM), lower than the plasma concentrations present in humans receiving chloroquine treatment for malaria. The scientists speculate that the mechanism of action of chloroquine is likely to be inhibition of cathepsin L, a host enzyme essential for processing of the viral fusion glycoprotein and maturation of newly budding virions. In the absence of this processing step, virions are not infectious. 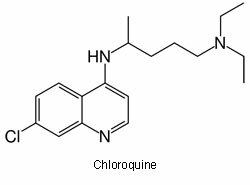 Chloroquine has previously been shown to suppress the activity of cathepsin L.
The authors of the current study, published online ahead of print in the Journal of Virology, suggest that the established safety profile and broad experience with chloroquine in humans should provide an option for treating individuals infected by these deadly viruses. Infection with hepatitis C virus (HCV) is a major cause of acute hepatitis and chronic liver disease, including cirrhosis and cancer. Current treatments are not able to cure all of those chronically infected with the virus, and there is a real need for new therapies. An interest in novel cyclophilin inhibitors for the treatment of HCV arose out of the observation that cyclosporin-A, which is widely used in the management of liver transplant recipients, also inhibits HCV replication. Scynexis has recently released top-line results of a Phase Ib study of its non-immunosuppressive cyclophilin inhibitor, SCY-635, in adults with chronic HCV infection. The randomized, double-blind, placebo-controlled study showed that treatment with SCY-635 for 15 days was well tolerated and produced a clinically relevant reduction in plasma HCV RNA. 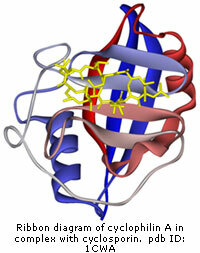 Cyclophilins are ubiquitously expressed proteins with peptidyl prolyl cis-trans isomerase activity that play an important role in folding and isomerisation of proteins. Although the isomerase activity of cyclophilin is critical for HCV replication, it is not completely clear which viral protein is modified by the isomerase; interactions with both the NS5B polymerase and the non-structural protein, NS5A, have been proposed. Preclinical data have suggested that viral resistance to cyclophilin inhibitors may not arise as easily as resistance to polymerase and protease inhibitors. 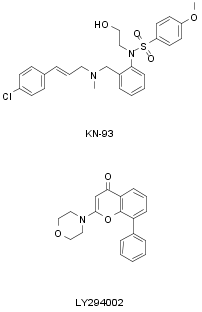 Other cyclophilin inhibitors that are being studied for the treatment of HCV infection include NIM811 and Debio-025. Positive clinical efficacy data have been reported for Debio-025, both as monotherapy and in combination with pegylated interferon-α. The first cases of severe acute respiratory syndrome (SARS), which is caused by the SARS coronavirus (SARS-CoV), are thought to have occurred in Guangdong province in southern China in November 2002. 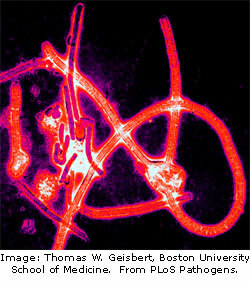 The virus quickly spread around the globe, with the total number of cases exceeding eight thousand by the summer of 2003. 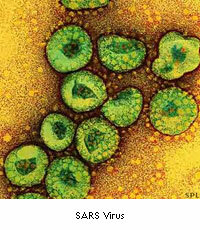 Although this outbreak was contained, the rapid transmission and high mortality rate of SARS prompted an investigation into the viral lifecycle and a search for effective antiviral agents. A recently published report in the journal PNAS describes the discovery of a potent inhibitor of the SARS coronavirus papain-like protease (PLpro). As well as proteolytic processing of the viral polyprotein, the protease is able to cleave ubiquitin and ISG15 conjugates, and also plays a significant role in allowing the virus to evade the immune system. Optimisation of an initial screening hit led to the identification of a non-covalent inhibitor, GRL0617, which inhibits PLpro with an IC50 of 600nM and inhibits replication of SARS-CoV in Vero E6 cells with an EC50 of 15µM. The X-ray crystallographic structure of GRL0617 bound to PLpro shows the compound binding within the S4-S3 subsites and inducing a loop closure that prevents catalysis at the active site. Although SARS does not pose a current threat, the identification of GRL0617 shows that inhibition of PLpro is a viable target for the development of antivirals against SARS-CoV. Over 150 million people are estimated to be infected with the Hepatitis C virus. During the early stages of infection, the majority of people are free of symptoms but a significant number will later develop cirrhosis and possibly liver cancer. Treatment is currently a combination of pegylated interferon-α and ribavirin, although several alternative therapies are being developed. Some of the more promising amongst these directly target essential viral enzymes such as the viral protease and polymerase. The non-structural protein NS4B is an integral membrane protein that also plays a critical role in viral replication. A new report shows that NS4B binds to viral RNA and describes the use of high-throughput microfluidic screening to identify compounds that inhibit this binding. 18 compounds that substantially reduced NS4B binding to its target RNA were discovered, and one of these compounds, clemizole, was found to inhibit replication of Hepatitis C virus in cell culture whilst showing little cellular toxicity. Clemizole is an H1 histamine receptor antagonist and, because it has already been tested in people, it could be rapidly evaluated as a treatment for Hepatitis C infection. Whilst moderate exercise in humans appears to enhance immune function and resistance to viral infections, there is evidence that exhausting exercise suppresses the immune response and increases susceptibility to infections. Intense exercise stress has also been shown to increase susceptibility to upper respiratory tract infection in mice. A new study shows that quercetin can lessen the impact of stressful exercise on the susceptibility to influenza virus A infection in mice. 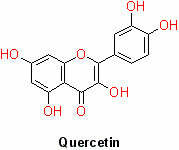 Quercetin is a naturally occurring flavonol found in many fruits and vegetables, and is known to have antioxidant and anti-inflammatory activity. A recent study in trained cyclists has also shown that quercetin can help reduce illness and maintain mental alertness in physically stressed human subjects. Although quercetin did not alter several measures of immune function, it did significantly reduce the incidence of upper respiratory tract infections in the cyclists during the 2 week period following intense exercise. Human Cytomegalovirus (HCMV) is a member of the Herpes virus family and infects 50-80% of adults in the US. After infection, the virus remains latent in the body for the rest of the person’s life. Most people who are infected with HCMV after birth remain asymptomatic unless their immune system is compromised by drugs (transplant recipients), HIV infection or old age. 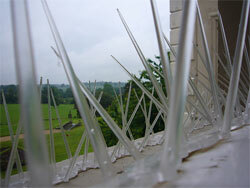 In such individuals, HCMV infections can become life-threatening. The route by which the virus enters cells is not well understood, but a report in the journal Nature now shows that the HCMV glycoprotein B binds to cell-surface platelet-derived growth factor receptor-α(PDGFR-α), which acts as an entry receptor for HCMV. PDGFR-α is a receptor tyrosine kinase, and both laboratory and clinical strains of HCMV trigger autophosphorylation of the receptor, resulting in activation of downstream signalling pathways. Cells in which PDGFR-α was genetically deleted were non-permissive to HCMV entry, viral gene expression or infectious virus production. An HCMV glycoprotein B neutralizing antibody, an antibody to PDGRF-α and Gleevec, an inhibitor of the receptor kinase activity, also completely blocked viral entry. These data suggest that PDGFR-α is critical for HCMV infection and that the receptor provides a novel target for anti-HCMV therapies. PDGFRs also play an important role in angiogenesis and have been linked to the pathogenesis of some tumors. 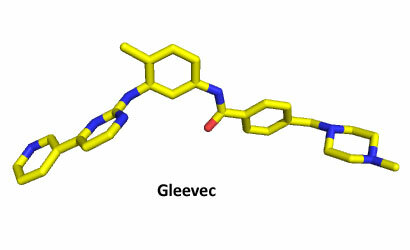 Gleevec is marketed by Novartis for treating certain types of cancer.